Father of Scientific Hebrew Grammar. Spanish-Hebrew grammarian; born in Fez, Morocco, about 950. At an early age he went to Cordova, where he seems to have remained till his death, which occurred early in the eleventh century. He was a pupil of Menahem ben Saruḳ, whom he later helped to defend against the attacks of Dunash ben Labraṭ and his followers. 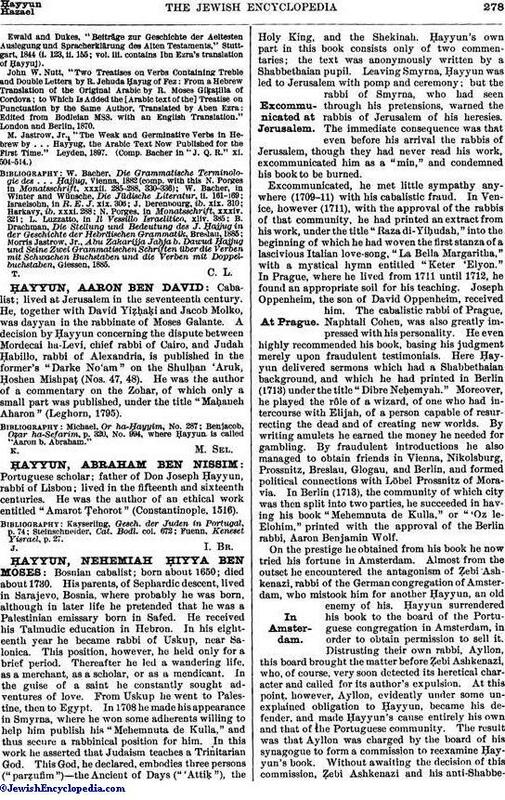 Later in life Ḥayyuj developed his own theories about Hebrew grammar, and was himself obliged to step forward as an opponent of the grammatical theories of his teacher. His thorough knowledge of Arabic grammatical literature led him to apply to the Hebrew grammar the theories elaborated by Arabic grammarians, and thus to become the founder of the scientific study of that discipline. The preceding scholars had found the greatest difficulty in accounting, by the laws of Hebrew morphology, for the divergences existing between the regular, or so-called "strong," verbs and the "weak" verbs. A hopeless confusion appeared to reign here in Hebrew; and much ingenuity was spent in endeavoring to discover the principles that controlled the conjugation of the weak verbs. 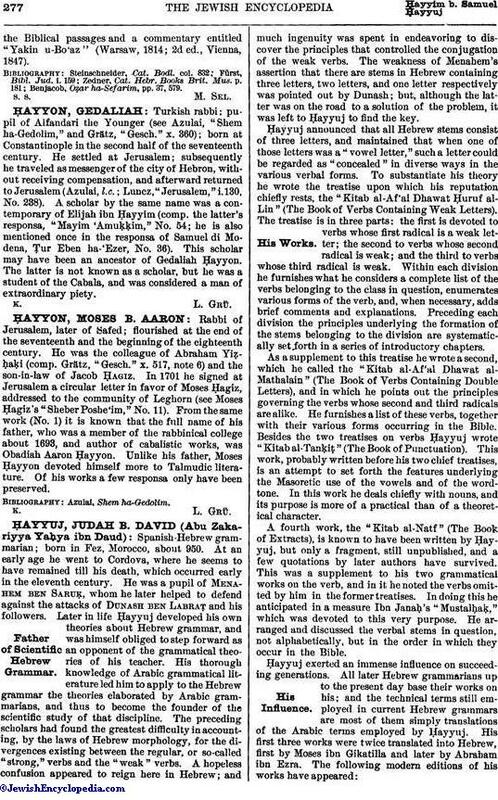 The weakness of Menahem's assertion that there are stems in Hebrew containing three letters, two letters, and one letter respectively was pointed out by Dunash; but, although the latter was on the road to a solution of the problem, it was left to Ḥayyuj to find the key. Ḥayyuj announced that all Hebrew stems consist of three letters, and maintained that when one of those letters was a "vowel letter," such a letter could be regarded as "concealed" in diverse ways in the various verbal forms. To substantiate his theory he wrote the treatise upon which his reputation chiefly rests, the "Kitab al-Af'al Dhawat Ḥuruf al-Lin" (The Book of Verbs Containing Weak Letters). The treatise is in three parts: the first is devoted to verbs whose first radical is a weak letter; the second to verbs whose second radical is weak; and the third to verbs whose third radical is weak. Within each division he furnishes what he considers a complete list of the verbs belonging to the class in question, enumerates various forms of the verb, and, when necessary, adds brief comments and explanations. Preceding each division the principles underlying the formation of the stems belonging to the division are systematically set forth in a series of introductory chapters. As a supplement to this treatise he wrote a second, which he called the "Kitab al-Af'al Dhawat al-Mathalain" (The Book of Verbs Containing Double Letters), and in which he points out the principles governing the verbs whose second and third radicals are alike. He furnishes a list of these verbs, together with their various forms occurring in the Bible. Besides the two treatises on verbs Ḥayyuj wrote "Kitab al-Tanḳiṭ" (The Book of Punctuation). This work, probably written before his two chief treatises, is an attempt to set forth the features underlying the Masoretic use of the vowels and of the word-tone. In this work he deals chiefly with nouns, and its purpose is more of a practical than of a theoretical character. A fourth work, the "Kitab al-Natf" (The Book of Extracts), is known to have been written by Ḥayyuj, but only a fragment, still unpublished, and a few quotations by later authors have survived. This was a supplement to his two grammatical works on the verb, and in it he noted the verbs omitted by him in the former treatises. In doing this he anticipated in a measure Ibn Janaḥ's "Mustalḥaḳ," which was devoted to this very purpose. He arranged and discussed the verbal stems in question, not alphabetically, but in the order in which they occur in the Bible. Ewald and Dukes, "Beiträge zur Geschichte der Aeltesten Auslegung und Spracherklärung des Alten Testaments," Stuttgart, 1844. (i. 123, ii. 155; vol. iii. contains Ibn Ezra's translation of Ḥayyuj). John W. Nutt, "Two Treatises on Verbs Containing Treble and Double Letters by R. Jehuda Ḥayug of Fez: From a Hebrew Translation of the Original Arabic by R. Moses Giḳaṭilla of Cordova; to Which Is Added the [Arabic text of the] Treatise on Punctuation by the Same Author, Translated by Aben Ezra: Edited from Bodleian MSS. with an English Translation." London and Berlin, 1870. Morris Jastrow, Jr., Abu Zakarijja Jaḥja b. Dawud Ḥajjug und Seine Zwei Grammatischen Schriften über die Verben mit Schwachen Buchstaben und die Verben mit Doppelbuchstaben, Giessen, 1885.